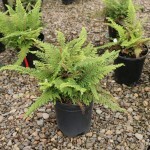 An evergreen fern with finely divided, soft, light green fronds. As the fronds arch, they also appear to swirl around the center, creating a whirlwind effect. It requires shade and regular summer water. A well-drained site is essential. 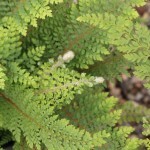 Use in the shaded areas of the landscape in mass plantings, in borders, or shaded rock gardens.